He has faced Marshall, Ambrose, Walsh, Wasim, Waqar, Warne, Murali, Lee, Bond, Mcgrath, Donald, Pollack, Malinga, Stein and all of them have bowed down to the master. I am talking about Sachin Ramesh Tendulkar. In the late 80's, I was a big fan of Viv Richards and Krish Srikanth for the power batting style. Krish Srikanth used the KISS (Keep it smashy and stupid) style of batting. That's when Sachin made his International debut. There has never been any sportsperson who has captivated me like "The Little Master".This post is a dedication to my favorite sportsman "Sachin". You would have come across various write-ups about the Master Blaster. But this one is a chrony special for Sachin. Sachin stand 165 cms tall or should I say short. Surprisingly that is my height too. He was born in April. Me too.ICC recently announced 24th of April as World Cricket Day. Sachin was born on that special day. Sachin's Dad "Ramesh Tendulkar" named him after the famous musician Sachin Dev Burman. He wanted Sachin to become a singer. Sachin never tried his vocal chords in singing, but AR Rahman can surely give him a chance in his future films. Who knows? Sachin's voice might just fit in. This picture is that of a 8 month old Sachin. Sachin was a born as a leftie. He had lovely hair and as he had curly hair, his parents never cut his hair for a long time. This is a very rare photo of a 2 year old Sachin. When Sachin picked up his bat, his folks realized that he was actually ambidextrous. He started throwing the ball with his right hand too. If you closely analyze the picture below, you can see that perfect stance that even professional crickets of the present era fail to apply after years of playing cricket. Little would he have thought that the Time magazine would one day call him the "The greatest living exponent of his craft.". Vinod Kambli and Sachin have been friends from childhood. They both entered the international scene too. But one fell by the wayside and the other is still blooming. Vinod Kambli recently created a fuss saying that Sachin could have helped him in his career too. The manner in which Sachin handled the situation makes me appreciate my sporting icon even more. Be it the Ball tampering incident or the Ferrari incident or the cry-baby-tantrums of Bal Thackarey, he has always maintained his calmness and composture on the field and off the field. A great lesson that all of us can learn from him. 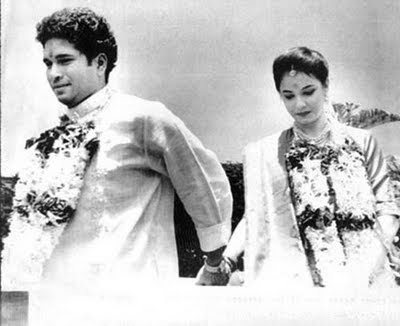 This click is a very rare click from the Sachin photo collection. I treasure this so much. Sachin also loves to play tennis and football. Sachin made his International debut against Pakistan. He was spotted by Dilip Vensarkar. The manner in which he fended bouncers from Waqar Younis and played the series won great praise from the Pakistan media. Two years later India toured Australia and the fiery pacer Merv Hughes commented to Allan Border at that time," This little prick is going to get more runs than you"
Sachin's rise to fame has never gone to his head. In the below picture, Gary Kirsten's son "Joshua" is giving catching practise to Sachin without knowing the greatness of Sachin and it seems he also taught Sachin how to bat. That kind of humility has never been seen in the cricketing world. "Greg Chappell", who single handedly ruined Indian cricket with his idiotic ideas tried to make Sachin bat at number 6. His brother Ian Chappell went on to say that Sachin should retire and pave the way for youngsters. Little did they know that Sachin was just beginning to play another two decades of cricket. Sachin's ten year old son,"Arjun has already made his debut" and he is also a powerful hitter of the cricket ball. He plays left handed and opens the batting too. If the media doesn't intervene into his personal life, he would be soon opening the batting for the Indian national team. Arjun and Sachin duo might be the first father-Son opening pair in the cricketing world. With Sachin's current form, this is a high possibility. The manner in which he creates, recreates records in the cricketing world, there might be no one else in the future to break his record. Only one thing comes to my mind when I see this picture below." Catch Me if you can"
Mathew Hayden:"I have seen God, he bats at no. 4 for India"
Peter Roebuck:"On a train from Shimla to Delhi, there was a halt in one of the stations. The train stopped by for few minutes as usual. Sachin was nearing century, batting on 98. The passengers, railway officials, everyone on the train waited for Sachin to complete the century. This Genius can stop time in India!!" Dennis Lillee:If I've to bowl to Sachin, I'll bowl with my helmet on. He hits the ball so hard. "There are 2 kind of batsmen in the world. One Sachin Tendulkar. Two all the others." I think he is marvellous. I think he will fit in whatever category of Cricket that has been played or will be played, from the first ball that has ever been bowled to the last ball that's going to be. He can play in any era and at any level. I would say he's 99.5% perfect. Tendulkar par Ungli nahi utha Sakte.."
and finally words from the Little master himself," I am not thinking too far ahead, just want to take it one thing at a time". These are the words of a man who knows what he is doing. Finally on a closing note, let me say a couple of things about Tendelya. A Sachin-like post for Sachin Ton-Dulkar. Fabulous with the posse of pictures, words and other testimonials fitting in perfectly. Enjoyed it. Very much appreciated. :D.
The controversy surrounding Kambli in my mind is nonsensical. I did n't even pay heed to it. Sachin sure handled it well; here's not just a champion batsman but a champion man. Lovely post.. This made me respect Sachin Tendulkar even more! Thanks for this short yet sensational innings on the Master Blaster! epo irundhu urupadiyana post elam bro? ena achi? this is easily one of your best posts:) loved it.. I love my god too. You deserve a TON for this. "It did not allow Saeed Anwar. It did not allow Charles Coventry. 200 was waiting to be made by Sachin!" Pls tweet it. We all will retweet. Sachin's father wanted him to be a musician, see what masterpieces has he created. Nice post, but what matter Chris ? Why getting all nostalgic ? Your 3-4 previous posts are treading on that line . Trying your hand in the non-humor zone ? wow! i got to know sachin so much better! thanks to you! Nice set of pics and good writing too! To, Sachin, the magician, who can stop a nation of a billion..
awesome post..... i think except Chappell brothers the whole world loves him to a great extent!!! one real thing which i thought after reading the post is..... whether this little master will make it into the 'Book of Life'..... God, please be gracious!! u dint leave the red undy here also :P...awesome research dude...thanks for the post :)..
awesome post dude!!! totally rocking!! loved it! good post..sachin is truly a legend!! Awesome job man! I was searching for Sachin's images and came to your blog. Thanks for the blog!